Home / how to / How to submit sitemap to Google automatically? How to submit sitemap to Google automatically? A sitemap is an XML file that contains the URLs inside your blog. This file helps crawlers to find all the URLs of your blog, through this you can show your website in a google search also by adding this you help Google to find out your website/blog. A sitemap is a collection of individual web pages on your website. It is an archive of every single web page on your website. This file should be easily discoverable on your site in order for search engines to stumble upon it. In simple words this an Index of your website where all your articles and pages are noted. It is hence very necessary for us to add this sitemap.XML file to Google. And not only just google you have to do it for all the search engines. So let's begin with the process:. 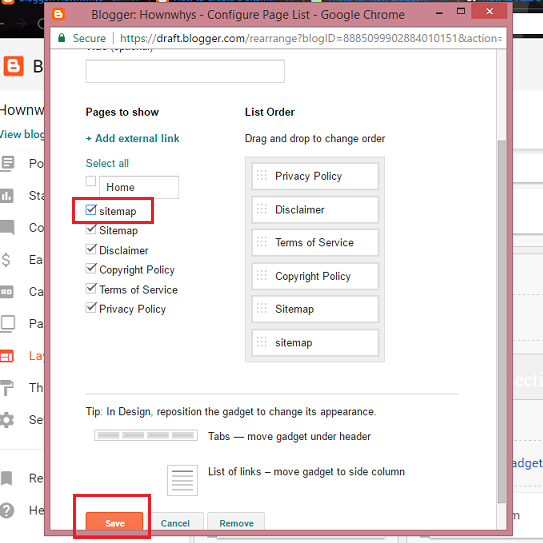 Now go to your blogger's dashboard - settings - search preferences, then go to custom robots.txt click on edit and enable it by clicking on "yes"
Paste your copied part of generated sitemap here and then click on "save changes"
How to add social media icons to blogger in just 5 minutes? What are the companies which provide the best web hosting under $4? How to add sitemap to Blogger? Go to your " blogger's dashboard" > pages > click on the "new page " button. ( in the end of the HTML code). Now, go to "option" and click on "Don't allow" under Reader's comments option and then click on publish. Then go to your blogger's dashboard in the Layout Tab. Select Add Widget (where you want to show your sitemap). From the widgets list select "Pages"
See how to create pages in a blog? Mark "tick" on the "sitemap" by clicking on the "box" and then click on "save". How to submit the sitemap to google webmaster tools? It is important to submit google sitemap to google webmaster as it again helps Google to crawl your site effectively and sitemap makes sure that not even a single page is left to crawl. For this, you need to open your google webmaster tool and select your site. 1. From the left of your dashboard select Crawl then click on Sitemap. 2. Click on ADD/TEST SITEMAP on the upper right corner. 3. A box will appear. Write sitemap.xml in the blank space. 4. Click on submit. And you are done! Your sitemap has been successfully submitted and now you will able to see the statistics of the pages indexed by Google on daily basis. I hope this guide would have solved your problem of adding a sitemap to your website as well as submitting it on google. If you have any queries then you can share in comments and we will be present to solve them. Yaa, this website is great for making sitemaps for blogger blogs.